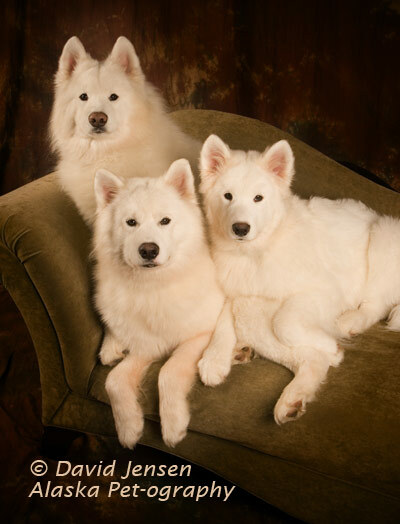 Welcome to Aurora Samoyeds, located in Anchorage, Alaska. We are a small kennel from working and showing Samoyed lines. We welcomed our first Samoyed into our home in the fall of 2002. This site was developed to educate future Samoyed owners and to share our wonderful experiences with all who care to see them. With our three Sammies, we participate in a variety of exciting activities. These activities currently include pack hiking and conformation. In the future, we intend to add sledding/carting, agility, and therapy. Please enjoy your visit to our virtual kennel. Here you will find information about the Samoyed breed, learn about activities you can enjoy with your companion, and news and photos from us. We are more than happy to answer your questions about Samoyeds and to help you find a good breeder or a rescue in your area if you're looking for a special relationship. Just write us!